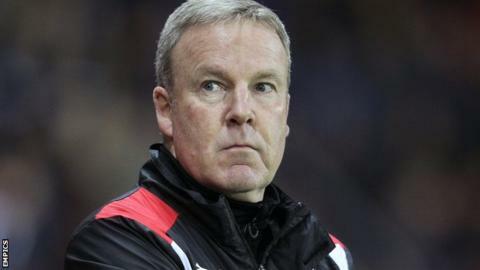 Former Wolves and Millwall manager Kenny Jackett heads the shortlist to replace Paul Cook as Portsmouth manager, BBC Radio Solent understands. Cook was unveiled as Wigan's new boss on Wednesday on a three-year deal after the two clubs agreed a compensation package for the 50-year-old. Jackett, 55, quit as manager of Rotherham in November after just five games and 39 days in charge. Cook's assistant Leam Richardson has also moved to the DW Stadium. "There's a shortlist that we're looking at," Portsmouth chief executive Mark Catlin told BBC Radio Solent. "I think it would be unfair to say that we've made any approaches for anyone at this moment in time. As a club, I think it's important we get this sorted as a soon as possible." Former Wales international Jackett, whose managerial career also includes spells in charge of Watford and Swansea City, has two promotions from League One on his CV with Millwall in 2010 and Wolves in 2014. Rotherham lost four out of the five games Jackett took charge of last season as they eventually finished bottom of the Championship.